Loved my plants. I cant wait to see them once they mature. The colors are amazing, and I am in love with the small trumpet flowers. The flower and color is simply amazing! I cant believe how much they have grown and how much color they have to them. Trumpet Creeper can be alluded to as the hummingbird vine. The Plant can be known for its blossoms that are long and trumpet molded and can be the length of four inches. The blooms can be shaded anything from red to white, even yellow. These blossoms show up amid the late spring months and turn into a noteworthy nourishment hotspot for hummingbirds. The plant can climb any vertical thing that it can hook. The roots develop shallow making it simple to transplant. This lovely and mystical vine usually blooms during the early spring on into the late summer months. It is beautiful and adds an abundance of color and life to all gardens and natural areas. Trumpet Creeper loves to be located in well-drained soils and can also survive moist and dry soil conditions. Trumpet Creeper vines are magnificent as they grow and look great when added to arbors and trellises for gardens and even sidewalk entrances. They are great to bring in bees and butterflies also to all locations where they grow. 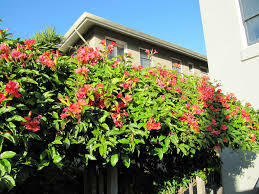 When they are in bloom, they provide a beautiful look and adds lots of curb appeal as they grow and mature. They are very simple to grow and works excellent also when planted around old buildings and other structures to add color and life to them. The flowers can range in color from red to orange to yellow, and bloom in summer and fall. The leaves start out with an emerald green color before maturing into a dark green. The trumpet vine is a fast-growing plant that can thrive in most soils. It can grow in both sunny spots and partially shaded areas. Fences and large poles are also useful for the trumpet vine as they can provide support for the plant's tendrils. The Trumpet Vine is a type of flowering plant that gets its name from the trumpet-shaped flowers it produces.